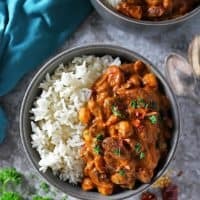 Gently spiced with coriander, cumin, smoked paprika and healing turmeric, this creamy, vegan, Easy Three Bean Curry can be whipped up in 20 minutes and is delicious served with some ready to serve rice. Over the last week, spring sprung the heck out of Athens, GA, leaving us with summer-like temperatures! Even though it’s technically not summer yet, I figured temps in the 90s gave me the excuse to kick off summer early. And, I decided to get my summer celebrations started by taking a much needed reprieve from juggling those web development courses I was taking. Summer is for slowing down – right? Another part of slowing down has been adding a little spin to the meals I prepare. I am not a huge fan of eating out so, instead of taking nights off of cooking and picking up takeout, I opt to cook half a meal, like I have done here. 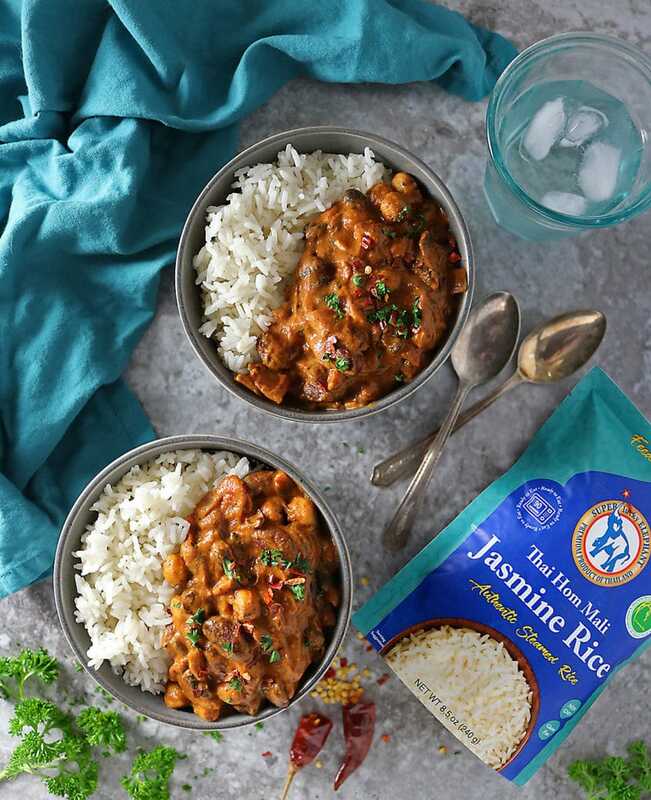 In today’s post, I cooked the creamy, vegan, Three Bean Curry you see here and instead of cooking the rice to go with it, I opted to heat up a packet of ready-to-serve Thai Hom Mali Jasmine Rice from Super Lucky Elephant. 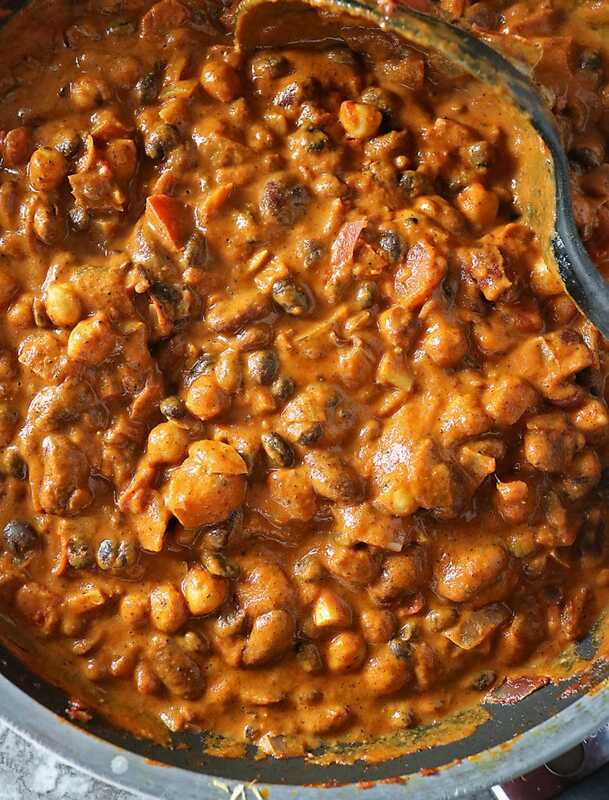 • I used canned chickpeas, kidney beans and black beans, but feel free to use your favorite variety of beans. 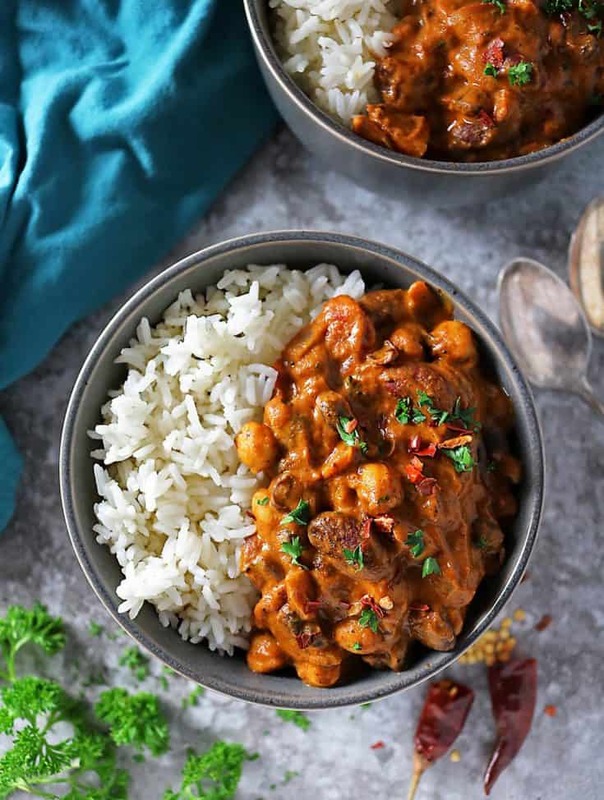 • I used coconut cream to make this curry luxuriously creamy, but, feel free to use half the amount of coconut milk and replace the other half with vegetable stock to make this less thick and creamy. 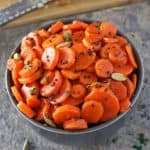 • I toasted the cumin and coriander before adding them to this dish as toasting the coriander and cumin intensifies their flavors as well as adds a nice shade of brown to this tomato-heavy curry. 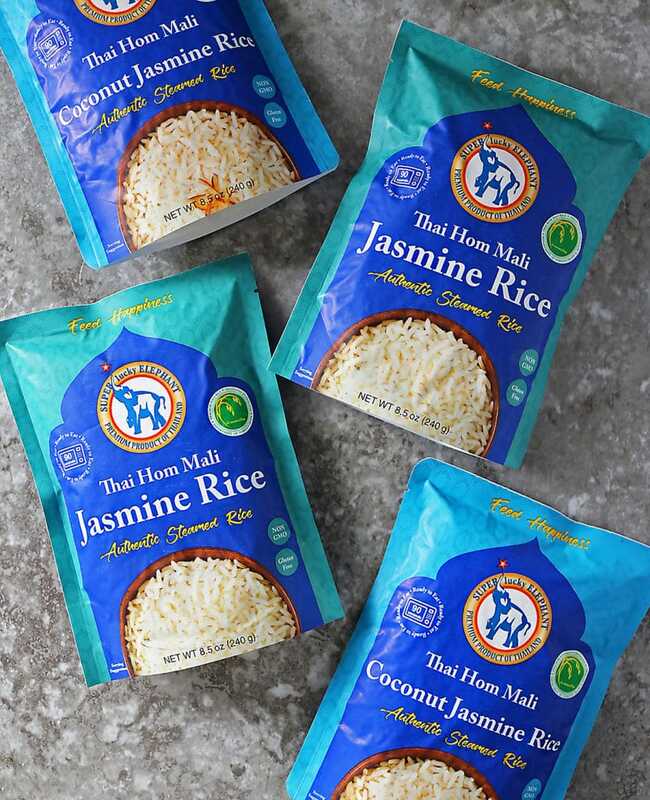 Have you had the chance to try Super Lucky Elephant Thai Hom Mali Jasmine Rice products? If not, I gotta say, Super Lucky Elephant Thai Hom Mali Jasmine Rice is so aromatic and flavorful. Super Lucky Elephant brings rich culture to my kitchen through every grain of Thai Hom Mali Jasmine Rice. Thai Hom Mali Jasmine Rice is an authentic, traditional rice grown, processed and packed only in Thailand (as depicted by the green and yellow seal on the packaging). It is the most prestigious variety of rice in the world – its purity and quality are certified by the Thai government. Super Lucky Elephant rice varieties are non-GMO and gluten free. Convenience without compromise – Super Lucky Elephant products are microwaveable and ready in 90 seconds. If you’d like to add an element or ready-to-serve flavor and fun to your meals, Super Lucky Elephant is a foundation of every meal that turns ordinary food into a delicious and shareable culinary experience. • Coconut Thai Hom Mali Jasmine Rice. You can purchase varieties of Super Lucky Elephant right from this website. Life can be hectic, but dinner with your family doesn’t have to be. 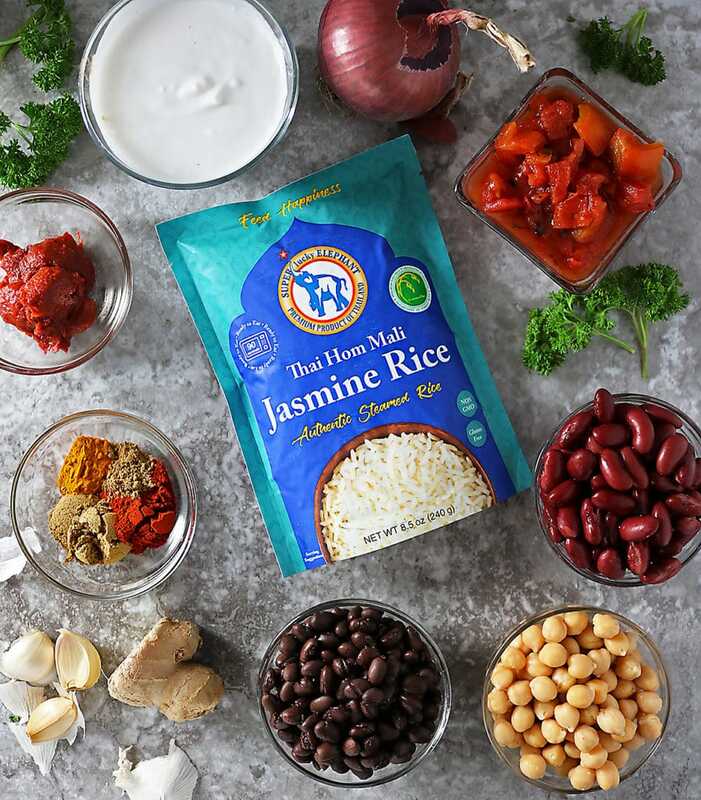 So, here’s hoping you get to slow down, skip the takeout and cook up half a meal with Super Lucky Elephant Thai Hom Mali Jasmine Rice products making the other half. Add olive oil to a pan over medium heat along with the chopped onion. Saute onion for about 5 minutes, stirring occasionally. Add in the ginger and garlic and saute another 5 minutes, stirring so they don't burn. 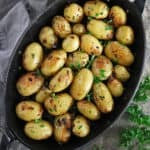 While onion, ginger and garlic are sauteing, place another small frying pan over a medium flame, add the coriander and cumin into it and dry saute the two spices for about 2-3 minutes - stirring frequently. The cumin and coriander will become a darker shade of brown. Make sure to keep an eye on them so they don't burn. Then add the toasted coriander and cumin into the onion, garlic and ginger. Also add in the smoked paprika, turmeric, fire roasted tomatoes, tomato paste, and coconut milk and stir till all ingredients are well incorporated. Add in the black beans, chickpeas and kidney beans and let simmer about 5 more minutes. Season with salt and pepper, garnish with parsley and chili flakes and enjoy with Thai Hom Mali Jasmine Rice from Super Lucky Elephant. 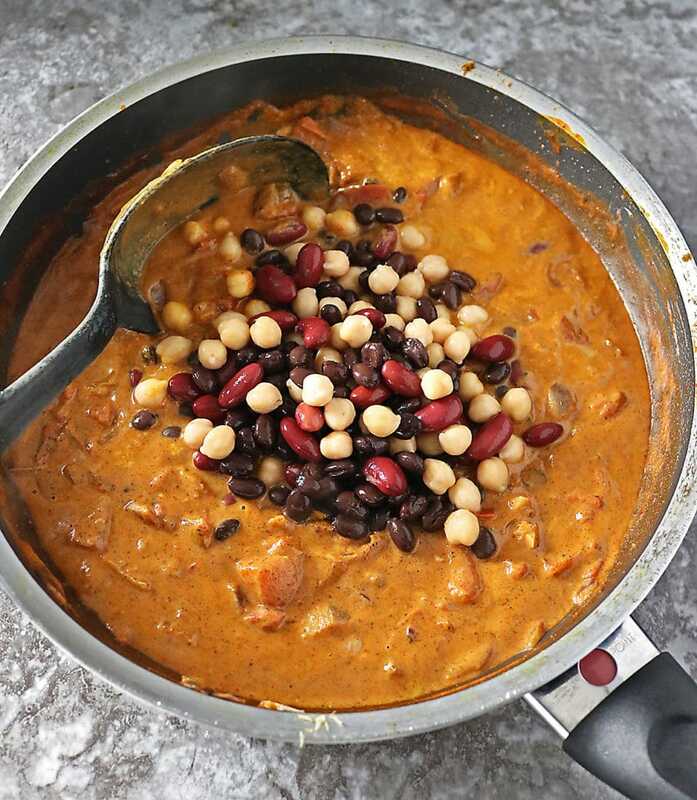 Beans in creamy flavoursome curry gravy must taste heavenly! A wonderful meal, Shashi. I love how this can be whipped up in just 20 minutes Shashi! And those delicious spices, coriander, cumin and smoked paprika are perfect for complimenting the 3 different types of beans. Yum! Have a great weekend and enjoy your break from all that studying, I know that coding and web development isn’t easy. I’m still trying to get to grips with it from the evening classes I attended 2 years ago! Temps in the 90s already? Woah. That’s intense! Winter is finally gone up here (took forever this year) and we’re into the 80s on some days…but 90s is just too much for me this early in the year. Oh, and speaking of slowing down, I agree! And I’m thinking you’re going to love Athens in the summer. Once all of the students leave for the summer, I bet that town is awesomely slow…unless we’re talking about the drivers. Haha! 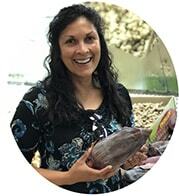 This curry recipe sounds amazing, Shashi…and I love how easy it is to make, too! Well done, my friend! Saving this recipe for later. 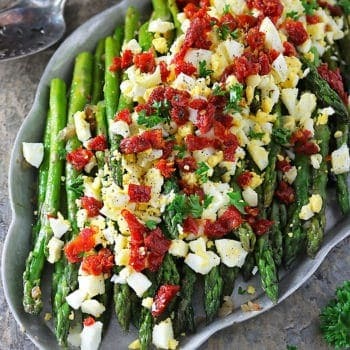 I’m a sucker for vegetarian recipes like this. Looks super comforting! Wow. I never thought of beans curry. This looks delish and hearty. And gets ready in little time. This recipe is definitely a keeper. 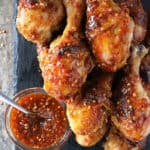 So flavorful and so quick – two of my most favorite things! 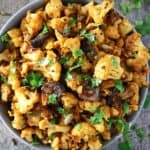 This vegan version looks absolutely delicious!!! I am drooling over here! What a hearty and comforting meal! 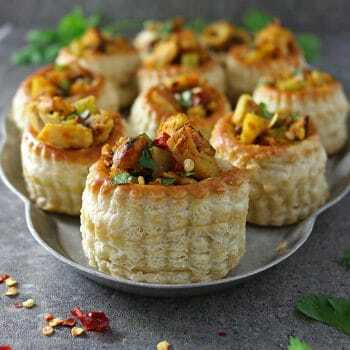 Looks yummy and easy to try at any time. Thanks for the healthy recipe. Will try this soon. Just tried this and it came out pretty well! My only observation is that the spice flavor didn’t end as ‘deep’ as I would have liked, even with toasting. Next time I may try increasing the amounts. Thanks!